You know how the Temptation story goes. After his baptism in the Jordan River, the Holy Spirit leads a Spirit-filled Jesus into the wilderness. When Jesus enters this barren wilderness, he fasts and prays for forty days and forty nights. When this physical ordeal ends, he faces three spiritual tests. This experience forms the basis of our Lenten season, whether or not we join Jesus in his fast. Many have followed Jesus into the desert. They go there to purge themselves of spiritual distractions and sin. Desert fathers like St. Anthony went into the desert and practiced extreme forms of asceticism, and like Jesus they reported battling with the devil. It’s just something that happens when you go into the desert by yourself. Although many people find fasting to be spiritually liberating, the decision to pursue this kind of spiritual ordeal must be a personal one. Whatever form our own discipleship takes, whether it includes ascetic practices or not, the question is, will we follow Jesus along the road less traveled, or will we take shortcuts that ultimately lead us away from God’s presence? As Luke tells it, after Jesus fasted for forty days and forty nights, he was starving. He needed to eat, but the wilderness was barren of life. All that was there in front of him were stones. He could turn stones to bread, but is that the way of God? Is the way of God self-serving? From there the tests Jesus faces get tougher and more enticing. Who doesn’t want power? And if you can get it the easy way, why not do it? All Jesus has to do is worship the devil, and the world is his. He won’t have to face the cross or any hardship. Later on in history, Christians were faced with the prospect of venerating the emperor. Many did, believing it was a mere formality. Since idols are nothing, burning incense to them is nothing. But is this true? How often are we tempted to go along with the status quo, even if that means walking away from God’s ways? How many Christians accepted slavery or Jim Crow? How often do we go along with the crowd? Speaking of the crowds, if you can use a spectacle to get people’s attention, why not use it? Jump off the pinnacle of the temple and let the angels rescue you. That will be a show worth watching. But is Jesus just another magician or entertainer? To each of these temptations, Jesus says no. So, while we all may know this story, what does it have to do with us, besides being the foundation for the season of Lent? What message might we hear in this story? As I thought about this question, I was intrigued by David Lose’s suggestion that the devil was trying to sow mistrust. That’s a message meant for today. In the case of Jesus, the devil appears to be trying to put a wedge between Jesus and God. The devil tries to raise doubts about God’s faithfulness. Jesus is, after all starving and so he’s vulnerable to the question of where’s God? Lose writes that “our natural insecurity” can lead us to mistrust God, making us open “to the possibility, appeal, and temptation of the proposition that it is all up to us, that God is not able to provide and so we’d better take matters into our own hands.” Do you ever feel this way? Sometimes we can even spiritualize it by saying that we are God’s hands and feet, all the while taking upon ourselves our own yoke, not that of Jesus. What struck me about this idea is that we live at a time of deep mistrust. There’s a lot of cynicism in our culture today. Nobody trusts anybody – not the government, not corporations, not even the churches. Some of this mistrust is well placed, but not all of it. I see this mistrust played out all the time in conspiracy theories that get passed around, often through emails. If you’re on email, you probably get a few of these posts forwarded to you. If you check them out on Snopes.com you will discover that most of them aren’t true, and that many of them have been going around for years – only the names of the players change. There is, however, a difference between skepticism and cynicism. I’m a skeptical sort. I ask questions. But, cynicism is different. It’s a perverse feeling that leads to the kind of mistrust that builds barriers between people. It’s the kind of feeling that leads to racism, homophobia, nativism, and other such ideologies. Since I’m on the MCC Gun Violence Task Force, I’ve been paying a lot of attention to the debate over gun safety and gun control measures. This debate no longer seems to be about the right to hunt or even possess a gun for self-protection. People are buying huge arsenals of assault weapons and truckloads of ammunition because they believe they need to defend themselves against the government. Or, as the Vice President of the NRA warns, we need to arm against the anarchy that’s coming once the police are gone. And who should we fear – the people who don’t look like us. But it’s not just these high profile cases. We see this mistrust present in all areas of life – from our local governments, to schools, to our churches. No one seems to trust anyone. But, as followers of Jesus, is this the message he offers us? Jesus rejects the seed of mistrust, which is rooted in our acceptance of the message of the Empire, which includes idolatry, injustice, poverty, and violence – just to name a few expressions. 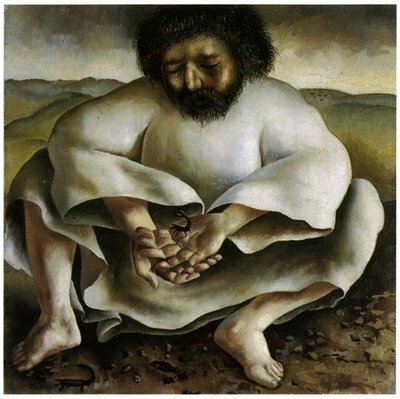 In this exchange in the desert, the devil offers power in exchange for worship, but Jesus rejects the offer. It’s an offer we should reject as well, since it’s said that we resemble the one we worship. Jesus chooses a different way, and offers to lead us along that path. In contrast to this false self that leads us away from God, a pathway that Jesus rejects, we can follow Jesus toward the True Self. We discover our True Self, when we encounter God living within us and around us. The fruit of this discovery of the True Self is, as Paul lays out, “love, joy peace, patience, trustfulness, gentleness, and self control.” Against these, Paul says, there is no law (Galatians 5:22). In his Wilderness Ordeal, Jesus faces the question of whether we will trust God or the Tempter. As we engage in our own Wilderness experiences, we face the same choices. Whom will we trust? In Romans 10 Paul writes that when we trust with our hearts, this leads to righteousness. That is, when we trust God with our lives, we experience salvation or righteousness. We become whole and therefore able to do follow the ways of God. Although Jesus trusts his life to God, the temptations don’t cease. Life doesn’t get easier. But he finds peace, joy, and strength in that relationship, and the same can be true for us. But, we must let go of our fears and our mistrust, and take the step of faith that leads to hope. It’s okay to have doubts, to ask questions, to live without certainty. But that’s different from living with cynicism and mistrust. As we embark on this Lenten Journey, God is inviting us to join with Jesus in living lives of trust rather than mistrust. When we do this, then we’ll find reason to celebrate the good things that God has done for us and will continue to do for us, for God is faithful. Therefore, while we start our journey in the barren desert, we end up with abundant life in the Resurrection.